I've tested it at various points over the years, always coming away impressed by the visual design just as much as the gameplay. The spaceship design really is quite incredible. Thankfully, the issues that plagued the Linux version (for me) in the past are gone. Multi-monitor support has vastly improved, with it not messing with my secondary monitor and going fullscreen correctly on my primary monitor. That alone, is a big deal for me and it's so much nicer. It's not really a game to play on a coffee break, there's quite a bit of depth to it and quite a bit to learn. It's worth it though, because it's absolutely fantastic. After trying it some more since the latest version, I was blown away by how engrossing it is now. There's so much about the game to love, starting off with nothing as you build up your fleet and empire while exploring the galaxy. The combat is absolutely my favourite part though, being able to take direct control of ships and get into the action while it's hot is awesome. I love that you can transfer your command to another ship, but you have to wait for your little transport shuttle to make it over during combat—very cool. After taking on a few small pirate fleets, I managed to salvage a few ships that weren't completely destroyed and turn them into fully armed and operational warships. A feature I was pretty pleased to see in the game, even if my fleet was utterly annihilated an hour later by a much bigger enemy fleet before I had a chance to expand my forces any further. You can pick up a copy direct from the official site. I absolutely recommend picking it up, brilliant fun. I'm going to be playing it a lot more now for sure. I'm following this star-gem since 2011. It's not getting old at all, amazing. Of all the illogical, stupid scenarios and mechanics we have to do our best to accept in the gaming world: Making a 2D game where you travel in SPACE - the absolutely ultimate three dimensional room in existence - is simply the dumbest I ever see. I mean - come the f*ck on - have your friggin' two dimensional playfields at least take place on firm grounds - or a concrete background. I can accept side-scrollers where you live on a world with no depth. I can live with platformers where there's only two directions to walk -forward or backwards. I get it. It's just a game. Fine, fine. But to see our spaceships slide around on an invisible skating ice in friggin' SPACE... With planets scrolling by in the distance and all the space in the universe (literary speaking) underneath you but you're forced to move on a flat surface... Get out of here. Just get out, take your game with you, and get in front of your drawing board again. If anything, ANYTHING need to be in three dimensions, it's SPACE. That's like your opinion, dude. I'd personally say as long as the map is wide and explorative enough, it doesn't really matter unless piloting your spaceship is a major and fun gameplay component. Even worse: if it's there and no fun. There's a long long list of 2D space the games that are great (Escape Velocity, Endless Sky, Trancendence...). The focus isn't as much on the space part, more on the story/mechanics. If you want 3D, there's other space focused games that make great use of the 3rd dimension (Kerb Space Program, X, Children of a Dead Earth...). I bought this years ago. Great game. Kinda been waiting for it to near completion before I play again. 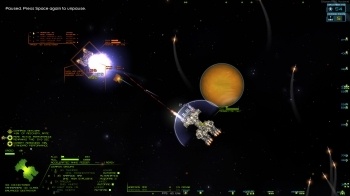 What const and denyasis said: some of my favourite space games are 2D. SPAZ, Reassembly, Captain Forever Remix, Nimbatus, Gravity Ace, Galak-Z, Drox Operative... there are probably others I love too. 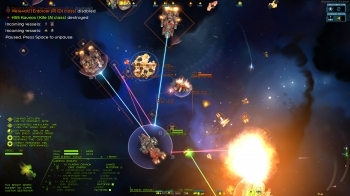 3D space sims can be amazing if they're done well, but their 2D brethren tend to keep my interest far longer, perhaps because so few 3D games are done well. Perhaps the added complexity trips them up? Who knows. scaine What const and denyasis said: some of my favourite space games are 2D. SPAZ, Reassembly, Captain Forever Remix, Nimbatus, Gravity Ace, Galak-Z, Drox Operative... there are probably others I love too. The thing is, I can count a lot more 2D space sims done well, than 3D. Most 3D space sims end up boring, as it's a lot harder to fill all that extra space and make use of it to the point of making it interesting. I'd say the point of the games, 2D vs. 3D, are very different. The 2D space game I have played, well, space is just a "setting" and less of a mechanic or impetus for playing. Transcendence is NetHack in a space setting. Escape Velocity, is more a top down RPG. Actually, it seems like a lot of them are RPG's or RTS's. I will add, that two of my most memorable gaming moments growing up were 3D games. One specifically, X-Wing, was a 3D space shooter. So I can't say 3D is worse or more boring than 2D when done right. Beamboom If anything, ANYTHING need to be in three dimensions, it's SPACE. Imagine someone would make a 3D game in space that is physically correct and you have to plot courses to other planets which are moving all the time and will be at a completely different place when you get there. I think only very few people would have fun with this.